In a landscape of increasing automation, business intelligence (BI) is no exception. At the forefront of this automation is the push for artificial intelligence and machine learning, which has permeated the BI market and is changing the way that businesses think about their data. However, as with any technological frontier, machine learning can be an uncertain topic for businesses. What does machine learning look like practically? Is it designed for the data scientist? The business user? Both? Is it a passing phase or something to invest in? At its core, business intelligence should help users make sense of their business data. 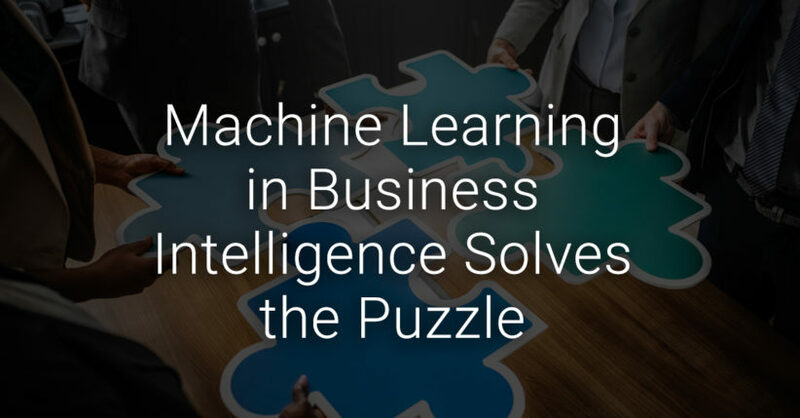 Not only does machine learning assist in this process, but it also transforms the way that BI is shared among different departments and optimizes data-driven decision-making across the board. Machine learning is a form of artificial intelligence in which a machine can perform tasks without being explicitly programmed to do so. For example, machine learning can take a simple form wherein a machine “learns” by parsing through large data sets and recognizing patterns (say, this image is either a bird or not a bird). Training a machine learning algorithm typically requires a lot of data that’s “cleaned,” or structured and organized deliberately. The data may be labeled to give the machine a sense for what it’s looking at, i.e. “bird” or “not a bird.” Such machine learning is referred to as “supervised” and is the kind of machine learning that businesses are most likely to encounter in this day and age. As such, machine learning has incredible implications for any business that wants to leverage data. The bird/not a bird example is an incredibly simple illustration of a classification algorithm, but it provides a helpful baseline of understanding. In reality, machine learning has been developing with more speed and efficiency to handle complex data with intricate relationships. For businesses, machine learning can manage the heavy data lifting necessary to get to the core of your performance. For example, machine learning algorithms can identify the factors that are contributing to and detracting from your brand health by analyzing your data from every angle. Machine learning is unique in that it can quickly identify relationships that may not be immediately apparent or intuitive to humans. Say your brand exhibits positive trends. Sales are increasing year over year. Penetration is up. Every graph and visualization arcs in a positive direction. With good numbers in hand, it can be easy to miss the bigger picture. And frankly, your team likely doesn’t have the bandwidth to dive deep, especially when things look good on the surface. Machine learning algorithms can identify the underlying currents. Sales may be increasing, but your market share is stagnant and the brand’s category is declining nationally. Meaning, sales are only a part of what they could be, and failure to adapt to a changing marketplace could result in decline over time. What was once a simple win for your team becomes an opportunity to get ahead of impending change. Of course, these machine learning algorithms can only be as useful to businesses as their integration into BI tools. Let’s talk about how machine learning can augment BI to solve common business problems and close the gaps in the existing market. Whether those insights be visual representations of data models or a text-based data summary, for example, business intelligence should live up to its namesake and provide the information necessary to make smarter business decisions. If BI tools largely succeed in this endeavor is another question entirely. One of the biggest gaps in BI tools is that they don’t align well with the way most businesses are structured. BI tools are generally designed for data scientists and analysts. In a way, this pervasive choice makes sense— after all, analysts and data scientists are best equipped to understand the data, iterate on insights, and ask targeted follow-up questions to build a more complete understanding of a data landscape. And yet, marketers, salespeople, category managers, and people typically falling under the “business” umbrella are on the frontlines of the decision-making process. BI tools can be needlessly complex and cumbersome for these employees. As such, BI tools often facilitate a cycle of dependency. Business people who want to make data-driven decisions must rely on data scientists to use BI tools. In turn, data scientists spend time building routine reports and answering marketing questions, for example, instead of leveraging their advanced degrees and skillsets. This cycle can easily lead to a backlog of questions, fatigue in your data scientists, and/or reluctance in your business people, who may decide that data-driven decision-making simply isn’t worth the frustration of relying on a third party every time a question comes up. Though BI tools have the potential to orchestrate incredible gains, they can be incredibly inefficient. This is where machine learning comes in. Machine learning is uniquely poised to close the gap in BI tools because it can perform important analysis and adapt to different data sets. These questions — the broad ones that get to the core of your performance — have historically been piled onto data analysts. Now, machine learning has the ability to perform the same research and generate fast, accurate results. It’s this automation that’s key. Machine learning is not positioned to replace data scientists and analysts — rather, it can free up their time so that they can focus on tasks that carry more value for your business. When data analysts aren’t shackled with routine reports, they can take their research to the next level. Machine learning also enables BI tools to adopt more business-friendly interfaces; after all, when algorithms perform the heavy data lifting, the user won’t need the same technical expertise to find what they need. In fact, we’re seeing exciting implementation of machine learning in BI tools. Augmented analytics is one such example, where a combination of machine learning and natural language generation allow users to ask questions of their data and receive insights in plain language. (Check out our guide for an advanced breakdown of natural language). As such, machine learning is the necessary piece for truly self-service BI tools. BI tools with machine learning implementations not only enable deeper insights into data, but they also empower business people to take analysis into their own hands.